Why use NEET Previous Year Question Papers? How to use NEET Question Papers For NEET Preparation? 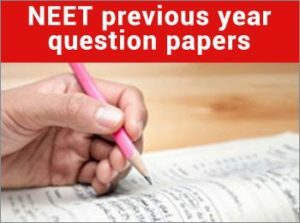 NEET Previous Year Question Papers With Answers (2013-2018) Free Download: Earlier, NEET exam was conducted by CBSE – Central Board of Secondary Education. But from 2019 onwards, NTA (National Test Agency) will take over the organization of exam. Being a doctor is a big responsibility. Along with responsibilities, comes a good pay scale, pride and respect. Due to this many parents wish their son/daughter to become Doctors. More than a million candidates appear for the exam with only 1 lakh candidates getting admission into good renowned colleges in different parts of India. Such is the competition when it comes to NEET. The candidates aspiring to become doctors need to study hard and smartly. Solving the NEET past years question papers is one way to do it. So here we are sharing NEET UG Question Paper for Previous Year. The candidates appearing for NEET 2019 should note that paper solving is an important part of NEET preparation. Here we are sharing why a candidate should solve NEET Previous Year Question Papers. NEET Question paper focuses on important concepts. The concepts do not change every year. So it is highly probable that questions or concepts may repeat in an upcoming question paper. Solving previous year question paper helps time management. It is foolish to directly appear for the exam and expect to finish in 3 hours. Solving papers at home helps the candidate to analyze the amount of time he/she needs to spend on each question. The candidate gets an idea of the level of exam and questions asked. The applicant also gets an idea of OMR sheet which is not used regularly by most students for study purpose. First of all, candidates appearing for NEET need to study NEET 2019 Syllabus with depth. Once you feel that you have studied well, then get your attention to NEET Past Year Question Papers. It is said that solving previous year question papers helps as many questions or concepts get repeated in the exam. To solve NEET Question Papers, get a sample OMR sheet. OMR sheet can be bought from any stationary shop or can also be printed home online. Set an alarm with exact exam duration time. Once the time starts, start solving the questions and mark the answers on the OMR Sheet. Try to finish the paper in given time. It might happen that at first, you might not finish but as you practice more, the candidate is expected to finish the exam in given speculated time. Once you finish the exam, download the answer key and get your answers checked. Analyze the questions which went wrong and focus on those concepts. We have already shared why and how to use NEET Question papers from the previous year. Here we are sharing NEET Question papers from 2013 to 2018.